The ultra comforting Korean stew – Kimchi Jjigae recipe! 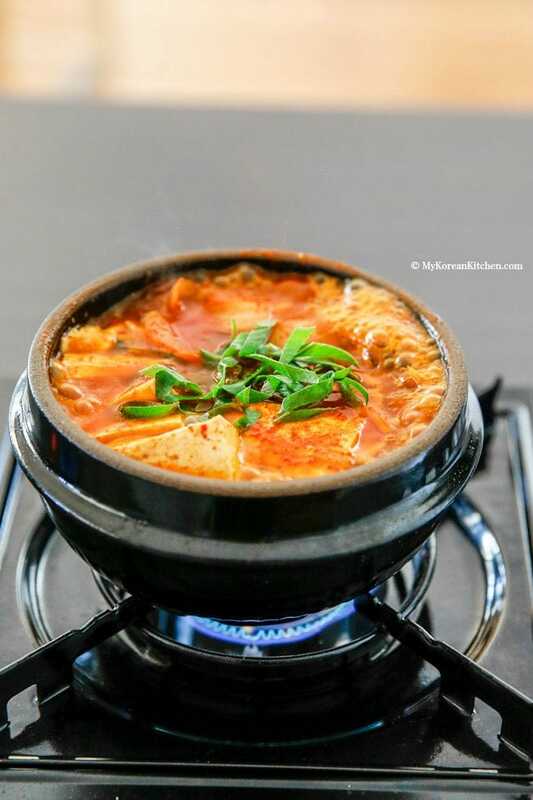 Kimchi Jjigae (김치찌개) also known as Kimchi stew or Kimchi soup is probably the most common way of consuming some aged Kimchi. It is a such a staple food in Korean households that typically Koreans would eat it at least once or twice a week if not more! 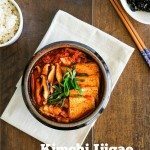 I originally shared my Kimchi Jjigae recipe back in 2006, when nobody knew my little website even existed. Every now and then, people try my Kimchi Jjigae recipe and they give me a raving review. Back to my Kimchi Jjigae, I love making Kimchi Jjigae with some fatty pork meat. Of course, you can make it differently using different types of meat (beef or tuna etc) but in my humble opinion, the fatty pork goes best with this soup. 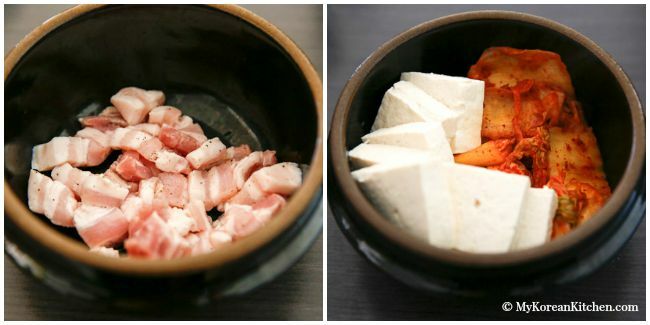 When the fat melts into the soup, it’s not just your ordinary Kimchi soup. It’s so comforting and irresistible! 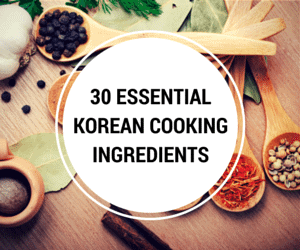 **If you’re not sure of the above Korean cooking ingredients, look them up from my 30 Essential Korean Cooking Ingredients post. 1. Marinate the pork belly with the rice wine and the ground black pepper for about 15 mins. 3. Put the marinated meat into the bottom of the pot. Add all the other ingredients (Kimchi, onion, mushrooms, tofu and the base sauce) except for green onion into the pot. 4. Boil the pot on medium high heat initially then reduce the heat to medium once it starts boiling. Cook further until the meat is cooked. (It takes 10 to 15 mins from the beginning of step 4.) Make sure the sauce is well blended into the rest of the ingredients. (This can be done by gently mixing the sauce around the soup with a small teaspoon and splashing the soup over other ingredients every now then). When the meat is cooked, add the green onion and turn the heat off. 5. Serve with rice (and other side dishes). 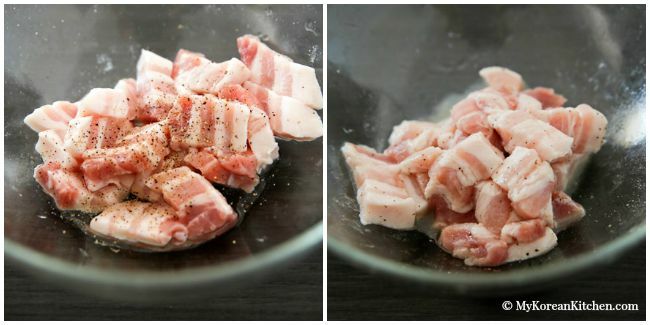 Marinate the pork belly with the rice wine and the ground black pepper for about 15 mins. Put the marinated meat into the bottom of the pot. Add all the other ingredients (Kimchi, onion, mushrooms, tofu and the base sauce) except for green onion into the pot. Boil the pot on medium high heat initially then reduce the heat to medium once it starts boiling. Cook further until the meat is cooked. (It takes 10 to 15 mins from the beginning of step 4.) Make sure the sauce is well blended into the rest of the ingredients. (This can be done by gently mixing the sauce around the soup with a small teaspoon and splashing the soup over other ingredients every now then). When the meat is cooked, add the green onion and turn the heat off. Serve with rice (and other side dishes). I’m making this for the second time. I haven’t stopped thinking about it since I made it last! I’m adding extra gochugaru and gochujang this time, as we like stuff fairly spicy. When I first told my trophy wife I was making it, she didn’t seem too excited, until I mentioned it was made with pork belly. SOLD! She’s REALLY likes pork belly. I used the remaining kimchi for a kimchi soup last time, I’m likely to do that again. Yum. I’m 65 and never tasted kimchi before, now I’m making up for lost time. Okay, made it tonight. Wow. Nailed it! Adding more spice was a good call. I told my wife I might tone it down a bit next time, because it was packing a punch! She said, “NO WAY!” So, I guess not. “More rice”, was her other suggestion. I made a recipe I found online for “pork belly bites” as an appetizer. Well, I’ll be making that again this weekend! I told you she was a fan of pork belly. Should have made a double recipe tonight. Shopped for all ingredients and plan to follow exactly. Many soups I make actually get better overnight…would this be good to make a day ahead and reheat to allow flavors to develop, or should it be eaten same day? Thanks! This tastes just like the jjigae I used to have when I was working in Anyang. Perfect to warm up on cold days. One of my favourite recipes. I didn’t have any gochugaru, so I used red chilli powder instead. Because it’s spicier, I only used a teaspoon, and put in a tablespoon of gochujang instead. Likewise I substituted the shiitake mushrooms for ordinary button mushrooms. While perhaps not entirely authentic, it turned out really well. Thank you for all your recipes, they are perfect for when my nostalgia kicks off cravings for Korean food. I’ve been craving this soooo badly recently but no one in my house likes kimchi (heathens!!). 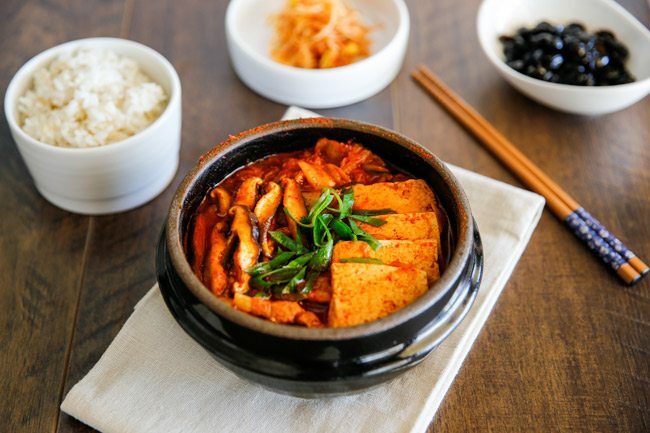 I am a vegetarian and my nearest Korean restaurant only make this with the pork – is there any way I can make this for myself without the meat? (kimchi made with seafood is fine by me, it’s just animal meat I don’t eat). I imagine the lack of pork will really take the depth out of it. Thanks Sue for such an authentic recipe. I also made a variation where I replaced pork with Sardines…really nice too. Can I make this recipe less spicy without destroying the flavor? I want to make it for my kids, but they can’t handle spicy food. I’ve had kimche jjigae in Korea a lot as its one of my favorites here. I find a lot of variation in the cooking technique for the pork that ranges from a quick cooked pork like your recipe and others make it with the meat cooked longer. I had it at lunch today and the pork was probably simmered for 45 minutes. I think that they cooked the pork first then added the other ingredients and finished it as you instruct. Can you comment on this? 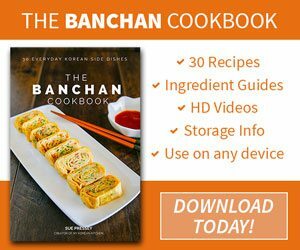 By the way your recipes are the best on the internet and are my go to for Korean cooking in Korea. You’re amazing that you can notice how long the meat was simmered for! 45 mins sounds excessive, but maybe it is was because the meat was bigger chunks and/or for the larger volume of soup? 🙂 & Glad to hear you are enjoying my recipes! I LOVE this recipe. It tastes just like the kimchi jjigae down the street from my aparment in Gwangju! I really helped with my homesickness now that we don’t live in Korea anymore. While the flavor was on point, I think next time I make it, I might double the water and double the base. I felt like this didn’t have enough liquid as it was. I really love kimchi jjigae broth, especially when I can soak big spoonfuls of rice in it. Thanks for providing this recipe! It’s a winner. I came across your site after searching multiple recipes online for Kimchi JJigae. There’s a girl that I like and I want to impress her by cooking her favorite korean dish(Kimchi Jjigae). Today, I’m going to pickup the ingredients and try cooking it. Based off the comments, your recipe looks to be the best one online! I’ll respond back with how my cooking attempt turns out! I just made the recipe with my old and too spicy kimchi 😉 As I tasted it, it was sooooo t I had to force myself not to devour it all, but wait for my man to come to dinner first haha. It is an amazing recipe, comes together so quickly and I cannot get over how easy it is to make. Amazing! Thanks again, I have only just recently discovered your skin routine, your food is the next obviously. 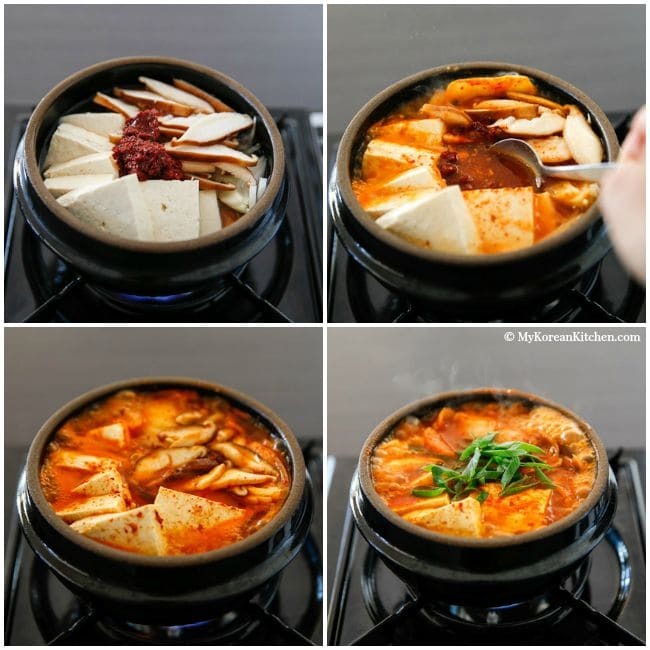 Does the black bowl/pots matter when cooking this kind of stew or any Korean dishes? I don’t have it so I was wondering if I can use a normal pot. Hi Sue, great recipe. I was wondering if to veganize it, I could just leave out the pork. Is there some other flavor/ingredient I’d need to replace it with? I made kimchi yesterday so will let it age before using it in the stew. Thank you! Hi Stacey, You can certainly make vegan version of kimchi jjigae, but yes, it might lack depth of flavor coming out from pork. I remembered I use this recipe, 2 years ago and when the results was super good, I decided to subscribe to your recipes via, email. Unfortunately I stop having those emails. I thought you were no longer active, and today I came back looking for this recipe and hey, you still update the blog, and it’s good to know that. Anyways, I will just want to check with you, how will it be possible to cook this recipe for 10 people, and they eat a lot, and I don’t think that small dolsot is going to fit and I dont have one too, any suggestion? If I were to serve it for 10 people, I would make it in a (heavy based) large stockpot like a dutch oven. If you go to the recipe card, which is located at the end of this post (before the comment section), you can adjust the serving amount. Just hoover your mouse cursor over the number. An adjustable blue bar will appear. But please remember that quantities in a bracket (after the name of the ingredient) doesn’t change. Only the first quantities before the ingredient name will change. Hope this helps! The best! I made it with my homemade kimchi, I am in love. I left out the tofu (just didn’t have any) and used thick cut bacon (no pork belly). So so delicious and complex of a flavor. Will be making bigger batches of kimchi with this in mind! After living in Korea for many years, I am finally experimenting with making kimchi jjiegae back in Canada. I think the meat marinating and base are key with the flavour because I’ve tried several recipes without these steps and the taste is not quite right. I’m still trying to get it exactly like the little hole in the wall restaurant in Daejeon but since after eating it in hundreds of restaurants since then (and it never being as good), I may never achieve that greatness. Thanks for the recipe. I had a Korean friend who took me to a restaurant and ordered me this and it came with rice and seaweed laver, and she put pieces from the soup on the rice and scooped it up with the seaweed. It was the best thing ever and I’ve been serving it like that at my house ever since but I have never again had it served with seaweed laver at a restaurant. Is it normal to eat it that way? How do I ask for it? I was wondering if it would be possible for me to substitute the pork with tofu since I don’t like most meats or tuna. Yes, you can add more tofu to compensate the pork portion, but the depth of flavor will be different. I just wanna say I make this about once a month when it’s cold out. I don’t normally have pork belly on hand so I will use a thick cut bacon. My boyfriend and I love it so much and it’s such an easy and hearty recipe. Thank you! Hi Julia, Great to hear you’ve been enjoying my recipes! You could use beef or canned tuna instead of pork. Enjoy! Sue, if I want to make this with tuna do I still add the rice wine? Do I need to make any other changes to the recipe? Thank you for your time on this website! 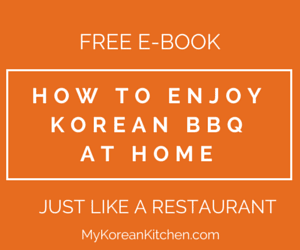 I very much enjoy your recipes, they make Korean food seem easier to manage, and are always so delicious! Hi Jane, I would still add rice wine for tuna. But I may reduce it a little bit depending on the volume of tuna I’m using. Also, I wouldn’t marinated it like 15 mins. Just 1 or 2 mins tops. Cooking time will be a lot shorter too. Hope this helps! Thanks for recipe. make it’s easy. Kimchi is nice salad in my country. This looks so delicious! I love kimchi. 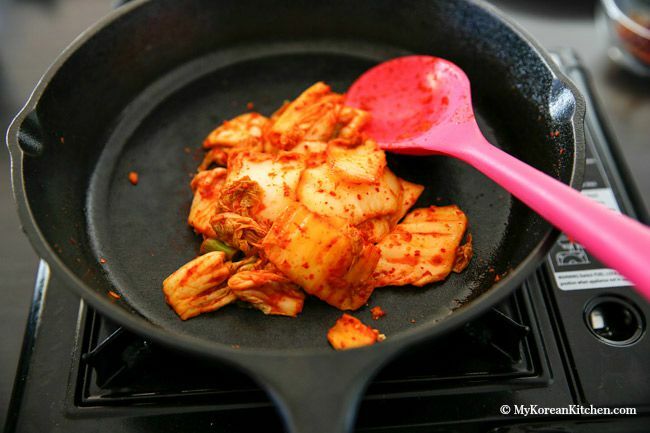 Have you ever tried making your kimchi at home? Maybe you already do! I really want to try my hand at making my own kimchi, I just haven’t had the courage to do so yet. Thanks for sharing this delicious recipe! I gave your recipe a try and it was so good. My husband loved it. Thanks for sharing this recipe. You are awesome! God bless! I make this stew over and over again! It is so fabulous! Thanks for being you. 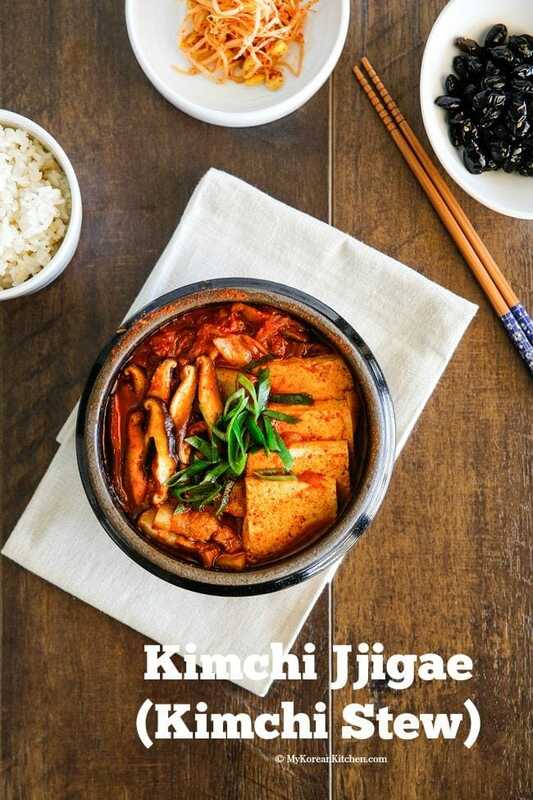 I really love Kimchi and I saw on a Korean tv show the Kimchi Jjigae dish. I really want to try this recipe but I don’t know where to get the ingredients. I’m not Korean, and I live in Canada. I have access to stores such as Sobeys, Safeway, Canadian Superstore, Co-Op, Costco, etc. Can you please email me where best to get these ingredients? Hi Jania, Korean ingredients are rare to find at a regular grocery store. (Though you might be able to get gochujang / Korean chili paste at a Costco.) Try visiting a large Asian grocery store or Korean grocery store. Google a Korean grocery store in your area. Also try Amazon CA. Some Korean items are available there too. Enjoy! Hmart, T&T and a lot of local asian food store will have gochujang and kimchi. Thank you, Sue, you’ve saved my marriage ???? Hi there.. just wanna ask. Can i omit the “rice wine”? Or are there any substitutes that i can use? Since i don’t consume alcohol ???? Sue, I Made this today…kimchi-jjigae is one of my favs from my time spent in South Korea. I used pork stew meat in lieu of pork belly. Everything else was the same. I cooked everything in a standand sauce pot as I don’t have the appropriate dol-sot. Great recipe, thanks. Dan from Texas. Great to hear that, Dan! I love kimchi jiggae and have used your recipe a few times and it’s perfect every time. Since I don’t have Korean chili flakes I tend to use whatever I have at home. But the end product tastes fantastic and my family thanks you for it. This was awesome!! I love kimchi so I thought I would give this a try, so glad I did! It was so easy to make, what a great recipe!!! I cant wait to try more of your dishes!!!!! I’ve already made this twice. It’s soooo good. I recommend substituting some of the water with kimchi juice though if you want a more intense sour flavor. Sue, another great recipe! I made it tonight. I did tweak it a bit by adding potatoes. Mahalo! I am hooked! This soup goes so well with fatty pork. I cooked the pork on pan together with kimchi then add the rest after pork is done and kimchi is soft. Heavenly! Thank you so much for this great recipe! Ate this the first time in an Auckland foodcourt and was blown away. Now that I’m back in Germany I thought I’d never come to eat it again until I found your beautiful site. Considering that I can’t get my hands on some really good Kimchi and I don’t eat it in NZ, the homemade stew is almost as good as it was back then 😀 Love the site, the layout and the videos! Keep up the good work! I love your tutorial video. 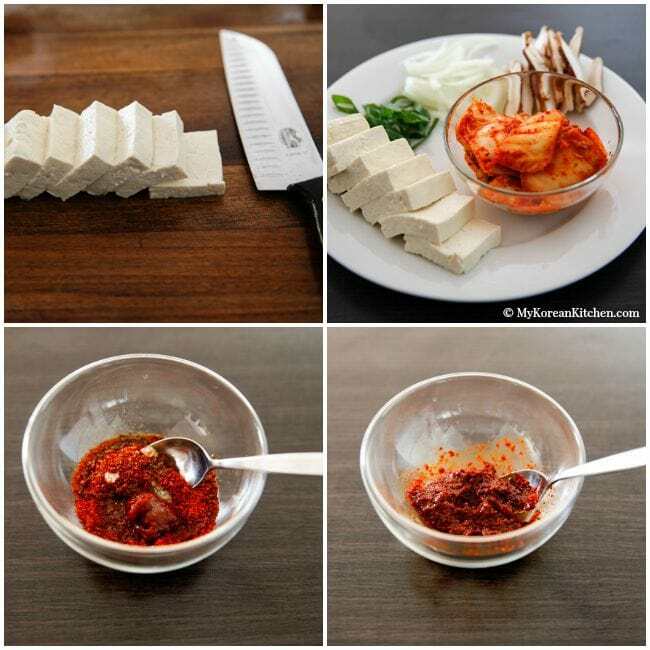 What a neat way to show how to cook Kimchi Jjigae! This looks amazing! Your photos make me want to buy one of those black bowls just to cook Korean soups :). Can’t wait to try it.